Personalize your party! 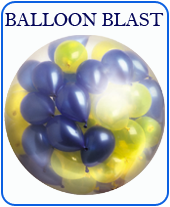 Choose a Bigger Balloon to Celebrate Big, as Bigger Balloons create Bigger Impression! Happy Birthday, We are Engaged, Just Married, Happy Anniversary, Best Wishes, Congratulations, Welcome, Baby shower, Holy Communion, My Christening ...whatever the occasion, its now easier than ever to greet with a personal touch and who wouldnt love that? Call us at 98942 98924 to personlize balloons for your next occasion!